The 9th leg begins with teams opening clues saying they MUST fly Air Canada back across the Atlantic to Montreal. Before leaving, Jinder celebrates his birthday today in front of the Eiffel Tower. Mickey & Pete promise it’s time to stop the funny business. And at the airport, Audrey gleefully tells the other teams about getting engaged. But when Sukhi & Jinder join the others at the airport, Ryan & Rob want nothing to do with them. They can’t believe the siblings would U-Turn someone with a Speed Bump! How dare they. 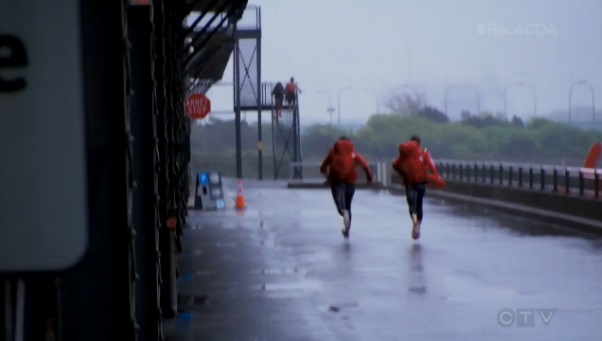 Sukhi & Jinder say Ryan & Rob would’ve done the same thing in their place and had hoped they would survive the Leg anyway. The teams are all on the same flight and once they arrive at the Montreal airport, they must find the Air Canada Priority Check-in Counter. There, they receive the next clue telling them to head to the old Mirabel Airport and find the Circuit ICAR, the International Center of Advanced Racing. Alain & Audrey arrive first and find the Road Block. In this Road Block, teams will take part in a two part driver precision course. 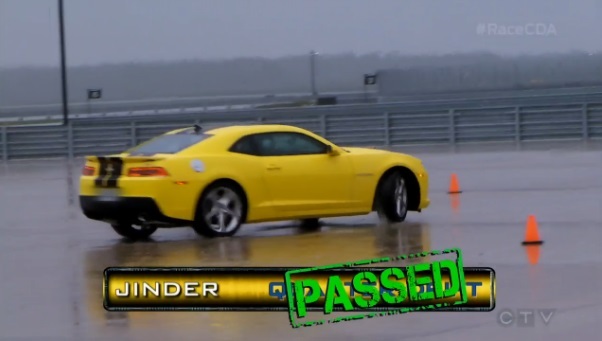 Driving a brand new Chevy Camaro SS, teams will first perform a quarter drift which involves them doing a fishtail maneuver around the corner. Next, teams must do a high speed reverse 180 turn. Alain and Meaghan decide to do the Road Block. 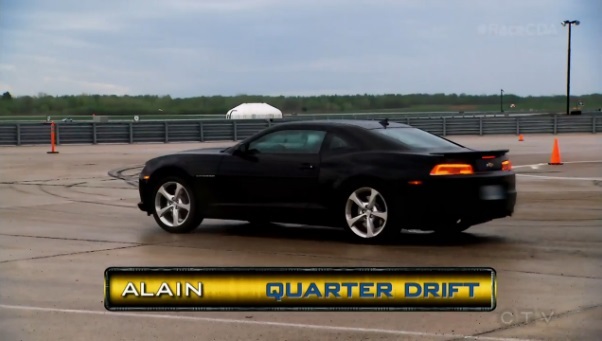 Both Alain and Meaghan fail the quarter drift several times before Jinder gets behind the wheel next. Mickey & Pete and Ryan & Rob arrive just as Meaghan passes the first part. Jinder gets it next. They move on to the 2nd part of the challenge which is much easier. Teams must make their way to Atwater Market and search the corner of Avenue Atwater and Rue Saint-Ambroise for their next clue. Mickey is next to finish while Alain, who is a stuntman, cannot believe he is struggling. He finally gets it with Rob close behind. Natalie & Meaghan arrive at the Market, but cannot find the cluebox. That allows Sukhi & Jinder to catch up. They open the clue to find the Fast Forward. 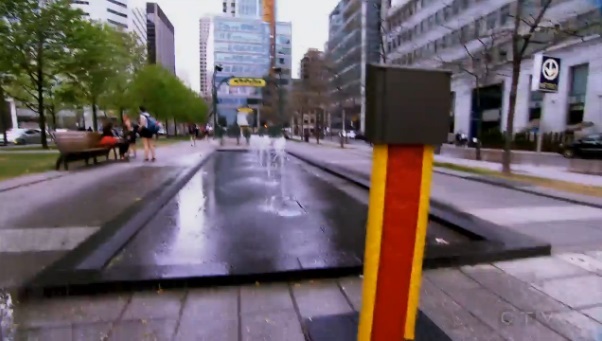 Sukhi & Jinder immediately decide to go for it while Natalie & Meaghan decide to play it safe and go with the Detour. For this Detour, teams will get to experience some Montreal art ad food. In Flamed, teams will watch an active demonstration to learn how to melt glass rods over an open flame to create five glass beads to match the sample necklace. In Grilled, teams will sample 10 different grilled cheese sandwiches. Once they think they’ve memorized the distinct tastes of the different cheeses, they must run 50 meters to Le Cheese food truck where they must correctly identify all grilled cheese sandwich flavors by memory. Natalie & Meaghan decide to do Grilled. Back at the Road Block, it’s Mickey then Rob then Alain in last. But thanks to traffic, the teams catch up to each other. Ryan & Rob start heading to the Detour, but decide to try the Fast Forward instead. Mickey & Pet and Alain & Audrey catch up to Natalie & Meaghan at the testing cart, but Alain & Audrey quickly decide to switch Detours as the cheeses taste the same. Sukhi & Jinder arrive at the Parisian Laundry, expecting to do some washing. But they find it is actually an art gallery and school. 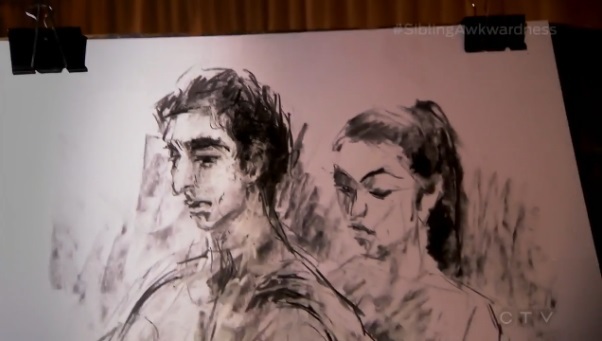 For this Fast Forward, teams must select a pose and get into position to allow a group of artists to sketch them. What they don’t know is that they will be asked to remove their clothing in stages until they eventually pose naked. If at any point a Racer feels uncomfortable, they can go back and choose a Detour. Sukhi & Jinder choose a pose and get started. Ryan & Rob arrive and seeing the siblings there, wonder if they should go back. Across town, Alain & Audrey arrive at the Espace Verre and start watching the demonstration. Back at the cheese, Mickey & Pete give it a go and get 6 correct out of 10 on their first try. When Natalie & Meaghan try, Natalie making her first guess causes Meaghan to completely lose her train of thought, so they have to go back. At the Fast Forward, Sukhi & Jinder and Ryan & Rob are told to remove all their clothes except their underwear. Ryan talks about the scar on his stomach from when he overcame testicular cancer. At the cheeses, both Mickey & Pete and Natalie & Meaghan have had their fill of cheeses but still no thumbs up. Alain & Audrey, meanwhile have their first set of beads done, but only one gets approved. Back at the Fast Forward, Sukhi & Jinder are now informed they must take off their underwear. After the initial shock, they decide to just hurry and get it over with. After a little while, they are given some robes and the Fast Forward award. Sukhi & Jinder can now go directly to the Pit Stop, The Belvedere at the Montreal Science Center. 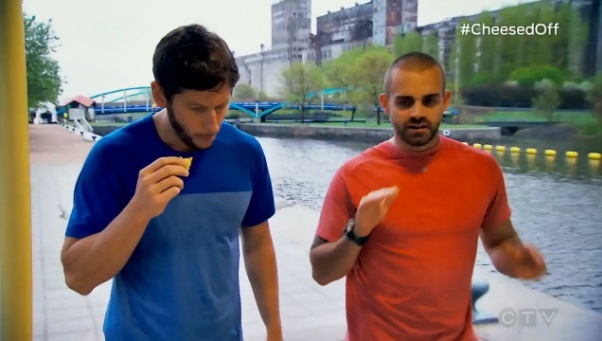 Ryan & Rob are informed that the Fast Forward has been taken, so now they must go back and choose a Detour. Sukhi & Jinder find Jon and he officially checks them in as Team #1. Doubling as a special birthday present for Jinder, they win a trip for two from Air Canada to Milan, Italy plus $3000. While Alain & Audrey are just one bead away to finishing, Ryan & Rob arrive and get started with the cheese. Mickey & Pete and Natalie & Meaghan are very close. Natalie & Meaghan ask Mickey & Pete if they want to work together, but the boys say Nope. Mickey & Pete get the thumbs up on their 11th attempt and get the next clue pointing them to the Square-Victoria Metro Station entrance on Rue Saint Antoine. Natalie & Meaghan decide to taste each other’s cheese to make sure and they finally get it on their 10th attempt. As Mickey & Pete and Natalie & Meaghan get the next clue and head for the Pit Stop, Alain & Audrey finally get all 5 beads approved. Natalie & Meaghan are right behind Mickey & Pete running to the Mat. But Mickey & Pete end up in 2nd place with Natalie & Meaghan in 3rd. On the way to the Mat in the taxi, Alain & Audrey are able to see Ryan & Rob are still at the Detour. They step on the Mat to officially check-in as Team #4. That leaves Ryan & Rob in last still at the Detour as night and the rain falls. They decide to switch Detours after their 32nd attempt. It is already the middle of the night when Ryan & Rob arrive at the Mat and Jon tells them this is actually a Non-Elimination Leg. An exciting and fun episode. Again, competition! It was great to see teams actually competing and not seeing one team dominate the entire Leg. The Road Block was pretty good and a little more exciting than usual race car tasks. The Detour was definitely challenging though. The grilled cheese was definitely inspired by the sausage task of last season (and TAR20’s Detour that induced Rachel’s “fun and good” quote). The Leg structure overall was fine, since there was the Fast Forward in the middle of it. Which itself is a very interesting placement. That may have justified the non-elimination. It’s always nice to see Natalie & Meaghan struggling. Not because I want them to lose, but because it takes them back down a peg and shows that they are real people and not superrobots. That they can struggle helps endear them and not make them lifeless and bland. Also, you know they will always recover anyway. Mickey & Pete are still fun. I actually wouldn’t mind seeing them in the Final 3. They may be out there and all mellow, but they have run a consistent Race and have been consistently amusing. Funny seeing Alain & Audrey do another crafty side of the Detour. I guess I kinda expected more from them in their hometown, but at least they didn’t get eliminated in it. They broke the hometown curse! And Ryan & Rob. Eeek. Another non-elimination Leg. On one hand, this may be the best and most enjoyable they’ve been al Race. But that they have been saved again is just ugh. 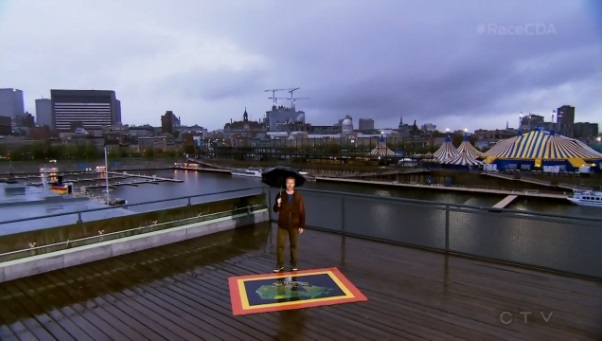 ← Recap: The Amazing Race Australia vs New Zealand, Episode 6 – I'm not going to come last, I'm going to just die on The Amazing Race."